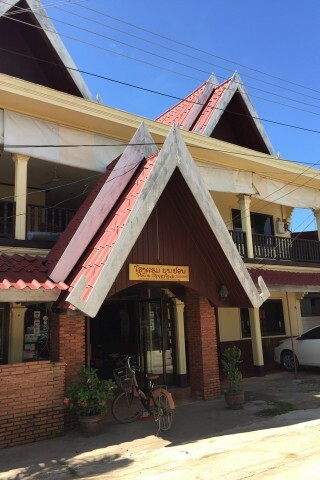 Pon’s River Guesthouse has been a backpacker choice for many years on Don Khong, no doubt in part because of its convenient location just steps from the boat landing. Average rating 7.5 from 73 reviews. The guesthouse is located across the road from the river and in most ways it is a typical Lao affair, with rooms on the small side, pale yellow walls and dark wood wainscotting. The bed has a thin mattress, clean white sheets and a mosquito net. While the wetroom bathroom is small and looking tired, overall, the offerings at Pon’s are tidy, clean and a backpacker will find it suitable for a night or two. Air-con is available, as is WiFi. Not as modern as neighbouring Souksabay or Kong View, both of which lie just up the road, travellers who are a little on the picky side can easily wander to inspect all three before deciding where to throw down their pack. The restaurant is across the street from the guesthouse and has a terrace on the Mekong—guests are free to hangout there. Pon’s can also arrange for tours and transport. Don’t confuse this guesthouse with Pons Arena, the higher end hotel just to the north of here. They share the same owner (and the same website) but are separate properties. Check rates at Pon’s River Guesthouse on Booking.com.